ERP is not a choice although it is necessary to grow your business and keep appropriately managed. ERP ease your work of resource management. Enterprise Resource Planning is integrated management software of core business processes. ERP is primarily a suite of integrated applications that a company can use to collect, store, manage and interpret data from the many business activities. ERP helps the business in many ways to manage the activities. ERP is designed and developed in such way that you can focus on your core job rather than wasting your time on administration. There are several ERP software’s’ which might be helpful. CRM is an approach to manage a sales team with the current and new customers. CRM could be used for data analysis using customer’s history to improve business relationship. The most important approach of CRM is extract data from different communication channels including phone, website, live chat, marketing, social media and any other. CRM solutions help in finding new customers and get their business and managing existing customers. CRM keeps all the details of customers like their contact details and prospect information which helps in building a healthy relationship and grow your business faster. You can manage communication preferences and also integrate other business tools like document signing, accounting, and billing, etc. Categorization of Leads:- A CRM system helps to identify new leads very quickly, and you can also categorize them. Lead prioritization can be done through CRM and converted into quality leads. Referral from Existing Customers:-It is said that happy customers always repeat customers. CRM helps you to understand your customers better and let you serve better which give you a chance to get another business from existing customer. Customer Support:- Nowadays customer’s expectations have increased. They want real-time customer support day and night. A CRM helps to go through complete history and give an answer at the real time. Cloud-based CRM:-CRM and cloud computing have changed everything. Now CRM has freed itself from on-premises CRM software after moved to the cloud. A cloud-based CRM allows you to work from anywhere and also reduce cost because it does not require any installation or any hardware setup. A cloud-based CRM offers you faster deployment, automatic software updates, cost-effectiveness, and scalability, increased collaboration. CRM let you close more deals in less time. You can perform many tasks through CRM like online survey, emails, campaigns and convert the visitor into customers. Social activities can also be managed through CRM portal. Lead Management:- It helps to generate leads, automate lead scoring and drive quality leads to closure. Analytics:- CRM provides the in-depth data statistics which helps to understand the customers. There are many companies which provide CRM services to their customers. We at W3care also give the CRM development Service Contact today for CRM development. Financial Management is a second most important feature of ERP (Enterprise Resource Management). Finance management is crucial for every company. Proper management of finance activities can save a lot of time and money for the company. Financial Management helps to manage your accounting books which include many sub-activities. This ERP module does many important things. An FM module can perform these tasks mentioned above in an ERP. Many people consider it as Finance Resource Management, and some other think it as Finance Risk Management. An E-commerce company can use most out of this module. This module makes sure that you perform financial activities hassle-free. Human Resource Management is also a critical module to be handled very carefully. HR module of ERP is helpful to manage things related to the human resource. HRM ease the workload of HR manager. It helps to manage employee’s details by category and their designation. HRM manages the employee’s list by their department, their birthdays, performance reports, appraisals, leave management, and salary calculations, etc. Human Resource Management module is helpful to evaluate the employee performance. Supply chain management mainly refers to the control of the flow of goods and services, which involves the storage of raw material, work-in-progress inventory, and finished products from the origin point to consumption point. SCM is defined at the chain of designing, planning, execution, control, and monitoring of supply chain activities. The core objective behind SCM is of creating net value, building a competitive infrastructure, leveraging worldwide logistics, synchronizing supply with demand and measuring performance globally. In the SCM module of ERP, you can manage products, stocks, purchases, sales, shipping and many more things. MRP especially refers to better planning of resources available in manufacturing company. Through this module, you can manage tasks, stop interventions, makes proper agenda for the manufacturing. MRP module is designed to centralize, integrate and process information for the better decision making, so this can be useful for inventory management and cost control in manufacturing. 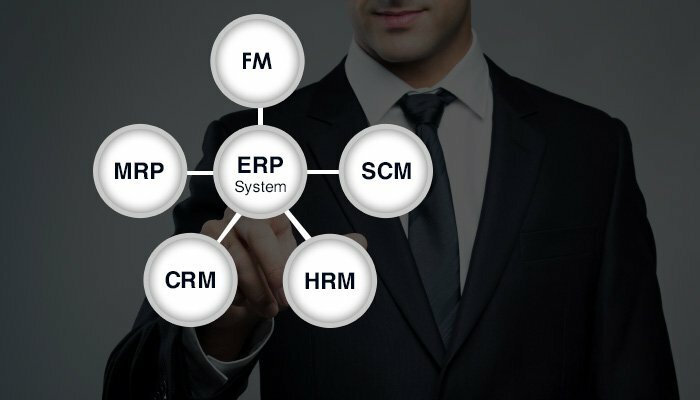 In the beginning, ERP was just software which you could use only on the installed system, so its use was limited; but later it was introduced as in cloud software. Now ERP modules can be used from anywhere according to your requirement. Many companies provide the ERP for the other companies to manage their data. Whether your company is a service provider or product provider, ERP is used to manage all the data and analysis reports which will be undoubtedly beneficial to the company. We have experienced and expert team of developers and designers. We are Website and App Development Company. Contact today for web/app development and designing.